In the wake of the defeat of Pauline Marois and the Parti Quebecois, Montreal-based actors/comedians Ken Fernandez and Armand Naftali will present a pretty unique show at the Leonardo DaVinci Centre on Saturday, April 26 (8 pm.) in St. Leonard. 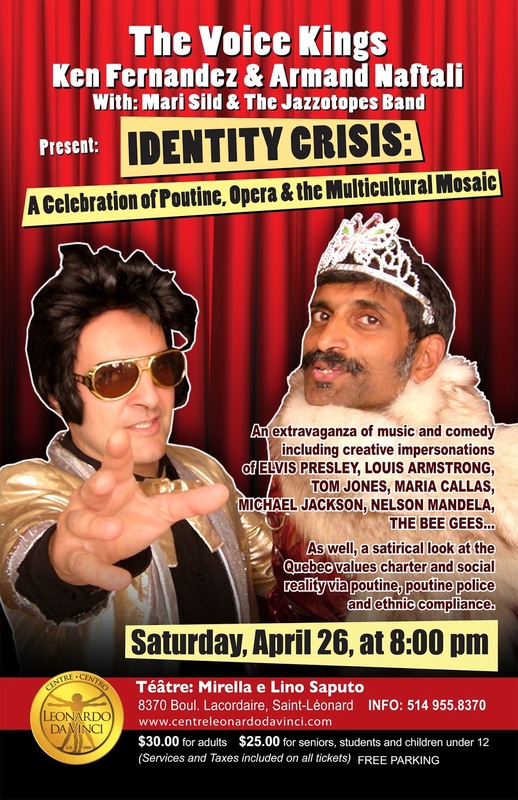 It is called The Voice Kings Present: Identity Crisis - A Celebration of Poutine, Opera, & the Multicultural Mosaic . You might recognize Fernandez for his 6/49 commercial, currently running on TV. Naftali has over two decades of experience as an Elvis impersonator. His repertoire now extends to Tom Jones, Julio Iglesias, Willie Nelson and Michael Jackson. What can be expected from their new show? Mandela and Elvis discussing exclusion on account of supposed values, and the importance of overcoming stereotypes and prejudice, followed by an Elvis solo; a Marois’ PQ fund raising book launch – La Nation C’est Nous, les 101 poemes de Pauline, to be interspersed with statements from Jewish, Muslim, Sikh, Hindu, Chinese, and Italian community leaders; Pauline urging her supporters and the Liberal government to enact Bill 202 : the Law on the Poutinization of Quebec (to include the legal obligations of “ethnic” restaurateurs regarding La Semaine Internationale de la Poutine - integral to Bill 202 , words from Inspector Jean-Guy Laferrière of the OPPPNQ, as well as the reactions of various cultural communities in accents and imitation language. Also to be featured: Jazzotopes, the band whose multi-ethnic make-up underscores the vitality of Canadian multiculturalism which will provide the background music.